It's hardly inspiring for the Supporters' Shield holders to sneak away from Chicago with a draw, but I actually thought they played pretty well on Sunday. Like I said above about the league as a whole, quality was missing on the final ball/shot, but New York fans shouldn't be too worried about the team's winless start. In this one there was quite a bit of good linking-up, particularly on the left flank. Given that midfielder Matt Watson was starting in a pinch as a nominal right back for the Fire, it seemed like a concerted effort from RBNY to expose a weakness on that side of the field. Between Roy Miller, Jonny Steele and Thierry Henry, there were some encouraging sequences down that side in particular; unfortunately for New York it didn't lead to any actual goals. *This stat/image is blatantly stolen from the Twitter account of MLS Fantasy Insider Ben Jata, @Ben_Jata. After seeing it this weekend, I was unable to think of anything better to include, so thanks, Ben! I'm not sure if this one is a good stat for Chicago fans or a bad one, but Mike Magee was conspicuously absent from a lot of the action this weekend (unless you count yelling incessantly and childishly at the ref as your definition of 'action'). But seriously: last year Chicago had 377 shots the entire season, and Magee either took or assisted on 116 of them (31%)*. Oh, and he only played 22 of their 34 games. The fact that he was involved in only 2 of the team's 24 shots (both of his shots were blocked, for what it's worth) could certainly be viewed as concerning for Chicago fans expecting another MVP-caliber season out of Magee. But on the other hand, it's easy to chalk up the struggles to the fact that this was his first game of the season after a maybe-contract-hold-out related hiatus. 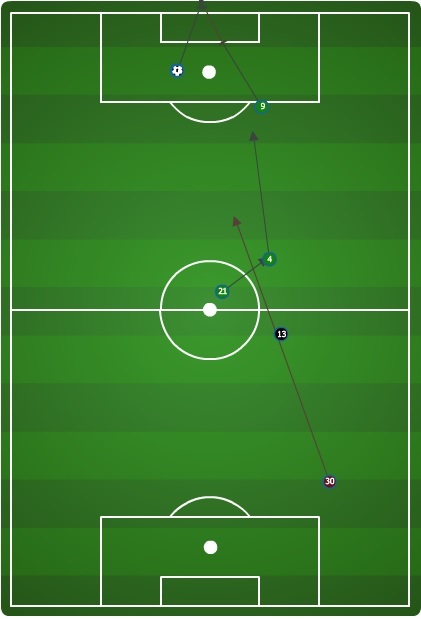 Also, the fact that Chicago managed to create 22 shots without Magee's direct influence (or Patrick Nyarko and Dilly Duka, both also out this weekend) has to be a good sign for a team that was often a one-man show last season: youngsters Harrison Shipp and Benji Joya in particular both seem capable of lightening the load. TFC captain Michael Bradley made headlines this week saying something along the lines of how possession was an overrated stat, and his team certainly appears to be trying to prove his point so far this season. The Reds didn't see a ton of the ball in their home opener, instead preferring to let DC knock the ball around with minimal penetration in the final third. And then when Toronto did win the ball, well, check out the Opta image that led to the game's lone goal for Jermain Defoe (or watch the video). It started with a hopeful ball from keeper Julio Cesar. The second ball was recovered by Steven Caldwell, who fed Jonathan Osorio. Osorio found his midfield partner Bradley, who lofted a brilliant 7-iron to fellow DP Gilberto. The Brazilian's shot was saved but stabbed home by the sequence's final Designated Player, Defoe. Balls like that one were played multiple times throughout the game by both Bradley and Osorio, as TFC has shown no aversion to going vertical quickly upon winning the ball. And with passes like that, speedy wingers, and quality strikers, it's certainly a strategy that may continue to pay off. This stat goes along a bit with what I wrote about Toronto above: they made themselves hard to penetrate in the final third, leading to plenty of incomplete crosses. 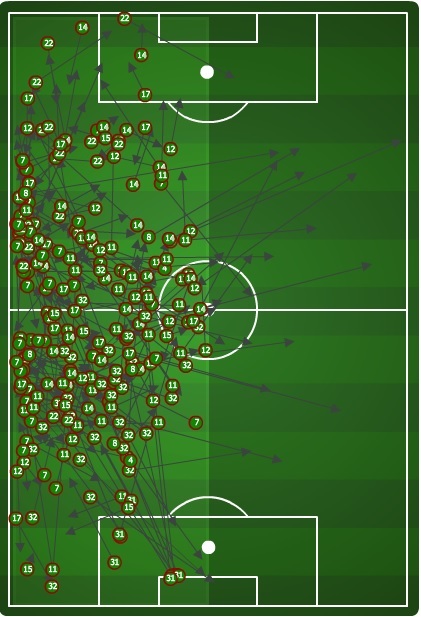 Some of this high number of aimless crosses also comes from the fact that DC was chasing an equalizer and just lumping balls into the box late in the match. Still, less than 5% on completing crosses is a bit of a red flag when you look at the stat sheet. Particularly when your biggest attacking threat is Eddie Johnson, who tends to be at his best when attacking balls in the air. You'd think Ben Olsen would expect a better crossing percentage. To be fair to United though, I thought they were much better in this game than they were on opening day against Columbus. They looked about 4 times more organized than two weeks ago, and about 786 times more organized than last season, and their possession and link-up play showed signs of improvement too. Still a ways to go, but at least things are trending upward for the Black and Red. I admit that I'm cheating here and not using a stat or an Opta Chalkboard image. But the above grainy screenshot of my TV that I took is too hilarious and impactful not to include. Colorado and Portland played a game on Saturday that some might call turgid, or testy, or any number of adjectives that are really stand-ins for the word boring. The most interesting parts of most of the game were Ricketts' adventures in goal, which ranged from dropping floated long balls to tipping shots straight in the air to himself. In the 71st minute it appeared Ricketts had had enough and essentially dropped the mic. Flying out of his net, he leapt into the air with both feet, apparently hoping that if he looked crazy enough the ref would look away in horror instead of red carding him for the obvious kick to Deshorn Brown's chest. 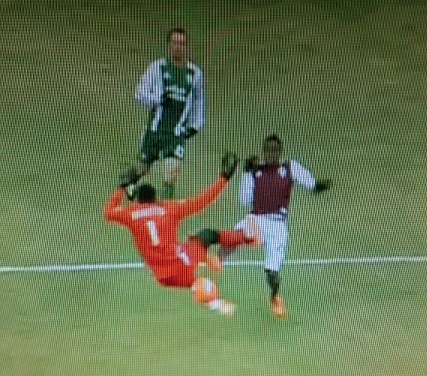 The Rapids converted the penalty and then added another one a few minutes later, and that was all she wrote. Alright, I was silly with the Portland section so I feel like I need to do a little serious analysis for this paragraph. The truth is that this game was fairly sloppy on both sides, which is particularly surprising considering how technically proficient Portland was for most of last season. But cold weather combined with early season chemistry issues makes teams play sloppily sometimes, and it didn't help that Colorado came out and looked very good to start this game. Their defensive shape was very compact when the Timbers had the ball, and the Rapids were very proficient in closing down passing lanes and taking possession back. The momentum swung back to Portland's side and back a couple of times throughout the match, but Colorado's strong start set the tone that Donovan Ricketts helped carry to the final whistle.